The Cotoletta alla Milanese: meaning a delicious breaded veal cutlets which will be fried in butter. It is a difficult Italian dish to prepare? Not at all if you follow our cooking recipe! Milan is proud of this recipe! The similarity of this dish to the WeinerSchnitzler coming from the Austrian tradition is not a case: Vienna and Milano are less than 200 miles apart, Milan was a part of the Austrian Empire. 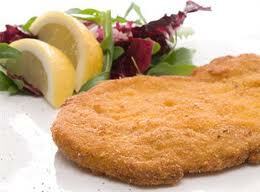 So don’t get surprised to aknowledge that cotoletta alla milanese resembles the delicious dish from Imperial Vienna! In time of Queen Jubilee in UK why do not you serve this to your guest? A royal meat for her Majesty the Queen of your house! For this recipe we will use only the veal: some will use also thinly sliced beef: the result will still be gorgeous, but you should use just good, high quality meat! Trim away the fat from the choosen piece. Divided in 4 cutlets and flatten the meat out between the palms of your hands, or with a stone, salt them, dip them in the beaten eggs, sprinkle them with the bread crumbs, pressing very hard to make sure that the crumbs stick on the cotoletta, and shake them to remove the excess. You want to melt the butter in a pan large enough for all your 4 cutlets, so you can cook it at once, and add them. Cook quickly, turning once, until both sides turn brown. Then serve hot, garnished with a slice of lemon on the side, some mashed potatoes or steamed green beans. also a good salad made of green leaves will be gorgeous! The wine? A Barbera will be perfect for our cotoletta! This entry was posted on Friday, May 4th, 2012 at 11:39 am	and is filed under Italian Recipes and Food. You can follow any responses to this entry through the RSS 2.0 feed. You can leave a response, or trackback from your own site.